Super Cute Easter Bunny Badge.this super cute yellow Easter bunny badge is perfect to give out to your children or pupils at Easter. 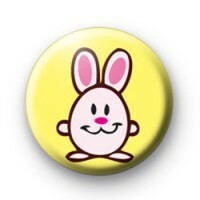 It's a bright yellow 25mm badge featuring a really cute illustration of the Easter bunny in white with cute pink ears. We have a huge range of Easter badges which are ideal for teachers to give out to students. Kids love them. All of our badges are hand made in our UK workshop.